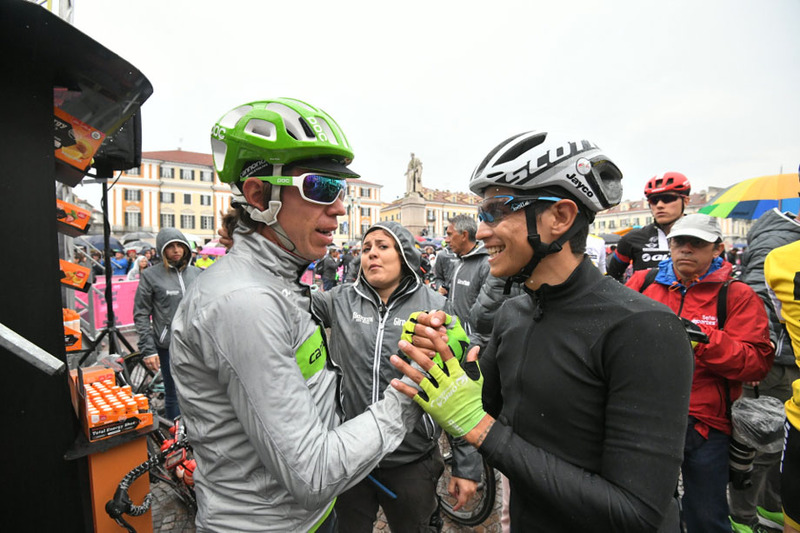 PezCycling News - What's Cool In Road Cycling : GIRO’16: Good Morning Cuneo! 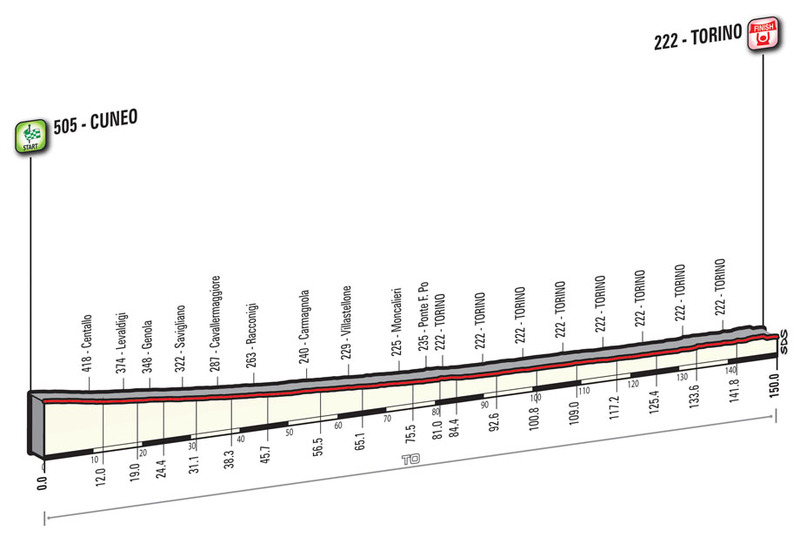 Sprinters' Stage from Cuneo to Torino. Points Classification to be decided today. Cuneo, 29 May 2016 – Good morning from Stage 21, the final stage of the 99th Giro d'Italia, Cuneo to Torino (163km). Today's possible sprinters' stage will decide the last jersey to be assigned: the Maglia Rossa of the points classification. The group, 157 riders strong, passed km 0 at 12.57. During the stage, 90 points towards the points classification are up for grabs, with time bonuses of 13 seconds. No more King of the Mountains points today: the jersey was decided in yesterday's stage. The route starts in Cuneo, runs through Borgo San Dalmazzo and then heads towards Torino, leaving Cuneo to the south-east. The stage course runs along wide and straight trunk roads across the plain, all the way up to Torino, where a final circuit is to be covered eight times. The final 7.5km circuit runs almost entirely along the right bank of the Po River. After passing over the finish line, the route runs around the Chiesa della Gran Madre and then tackles the only short climb of the stage (to be ridden eight times), leading to Villa della Regina (750m, with gradients ranging from 4 to 6%, with a short 8% stretch at the summit). Next, a fast-running descent leads into Corso Moncalieri, and then to the other bank of River Po. Here, the route passes under Ponte Balbis, enters Parco del Valentino and runs across the park up to the red flag. In the last 1km, two bends before and after Ponte Umberto I lead into the 600m long home stretch, on an 8m wide asphalt road. Cuneo was built on a triangular rocky spur (hence the name, which translates as “wedge”) rising at the confluence between the Gesso and Stura di Demonte rivers, against the spectacular backdrop of the Maritime and Cottian Alps. The long Via Roma leads into Piazza Duccio Galimberti; the large esplanade is lined with neoclassical buildings creating a 19-century atmosphere. Following recent urban development, long, tree-lined avenues have been derived along the ancient fortifications. The town’s distinguishing feature is the 800m long road and railway viaduct spanning the Stura di Demonte river at a height of 50 metres. Major architectural landmarks include the cathedral of Santa Maria del Bosco, the church of San Francesco and its adjacent cloister, and the monumental complex of San Francesco, home to the civic museum. Traditional chocolate truffles called “cuneesi”, either rum-filled or otherwise flavoured, are a much-appreciated local delicacy. The Giro d’Italia has been an “old friend” of the city since the first stage finish in 1914. The rider Niccolò Bonifazio was born here in 1993. Next on the stage course are Madonna dell’Olmo and Centallo, a busy industrial and agricultural centre, specialising in bean cultivation (“fagiolo di Cuneo”). The town has a rich historical past that is reflected in the old town centre. It was hometown to Italian patriot Santorre di Santarosa (1783-1825) and to astronomer and science historian Giovanni Schiaparelli (1835-1910). It is characterized by the large Savoy Castle of medieval origin; for a long time Racconigi was the favourite summer residence of the Savoy family. The Castle is under UNESCO protection. Next to it is a beautiful landscaped park, covering 170 hectares. This major horticulture centre is especially renowned for bell pepper cultivation (“peperone di Carmagnola”), owing to the fertile soil. Major landmarks in the town centre include historic houses, decorated arcades and the ancient church of S. Agostino. This town, whose economy relies mainly on agriculture, is known as the “land of potatoes and frogs”. The main landmark is the hilltop Royal castle, overlooking the city. The lower old town centre features typical architectures dating back to the Age of Savoy. Half of the stage will take place within the city, on eight laps of a 7.5km circuit running around the foot of the hill, on either side of River Po. The circuit winds its way around Borgo Po and the neoclassical church of Gran Madre di Dio; then a short uphill stretch leads to the foot of the hill in a prestigious residential area, with Art Nouveau mansions and well-kept gardens. The route leads into Corso Moncalieri and over the Po River, via the 19-century Ponte Principessa Isabella, entering Parco del Valentino. The route crosses the Po again via the famous and imposing Ponte Umberto I, heading for the finish in Corso Moncalieri. The Giro d’Italia has embraced Turin for over 40 editions. The majestic velodrome in Corso Casale, not far from the finish, used to host the final moments of the classics Milano-Torino and Giro del Piemonte. The 16th-century Duomo houses the Holy Shroud, believed to be the burial shroud of Jesus. Standing at 167.5 meters high, the Mole Antonelliana – named after the architect who built it – is regarded as the symbol of the city, and now houses the popular Museo Nazionale del Cinema (national cinema museum). Major landmarks include the Royal Palace, the Egyptian Museum, Palazzo Madama, Palazzo Carignano, Teatro Regio (the Royal theatre), the modern Lingotto complex and the Basilica of Superga, rising on top of the hill of the same name (672m) and overlooking the city. Among the many leading figures to hail from Turin are Galileo Ferraris (1847-1897), engineer and scientist who discovered the rotating magnetic field and invented the alternate current electric motor. TV coverage of the 99th Giro d’Italia will reach all four corners of the world: 184 countries will see the Corsa Rosa on 29 different networks, 24 of them live. 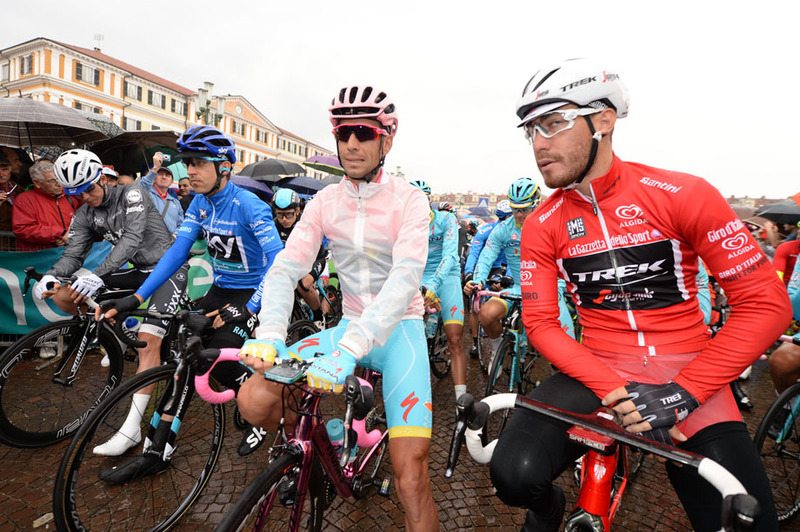 RAI – Radio Televisione Italiana, the longstanding host broadcaster, provides extensive coverage of the Corsa Rosa. The action is live in three separate programmes: “Prima diretta” ("Pre-Live") on Rai Sport 1, “Giro in diretta” ("Giro Live") at 15:10 - 16:15 in simulcast on Rai 3 and Rai HD, and “Giro all’arrivo” ("Giro on the Finish Line"), with the last hour of racing until 17:15. The traditional post-race analysis programme "Processo alla Tappa" ("The Stage on Trial") ends at 18:00. When the race reaches Italy, the stage start will be covered in Rai Sport 1's "Giro Mattina" ("Giro Morning"), showing the signing in ceremony, with interviews, the start of racing, and local colour. The strand "Journey through the Italy of the Giro d'Italia" will show historical and cultural anecdotes and features. For viewers unable to watch the stage live in the afternoon, the evening show TGiro ("Giro Bulletin") will tell the story of the day's racing from 20:00 on Rai Sport 1, followed by Giro Notte ("Late Night Giro"), with 90’ of stage highlights from 22:45 on Rai Sport 2. The Corsa Rosa will be streamed on the website www.rai.tv. In Italy the Giro can also be seen live on Eurosport, broadcasting to 53 countries across Europe from 14:15, with race commentary in 19 languages. In France, the stages are live exclusively on beINSports, with reports and features from the scene. The Dutch public broadcaster NOS is showing three hours of live racing of the first three stages in the Netherlands, as well as the final 90 minutes of the weekend stages in Italy, plus daily highlights of every stage. Free to air race coverage is live in Flemish via VRT, in Danish on TV2 Denmark, in Switzerland via SRG SSR, in Spain via Teledeporte and EITB and in Kazakhstan, in highlights, on Kaz Sports. The Corsa Rosa is live in South America on ESPN, with Portuguese commentary in Brazil, English commentary in the Caribbean and Spanish across the rest of South America. Colombian fans have a wide range of options, with live coverage on RCN and Señal Colombia. TDN is showing the race live in Mexico and Central America. beIN Sports is covering the Giro in the United States of America and RDS is providing French-language coverage in Canada. 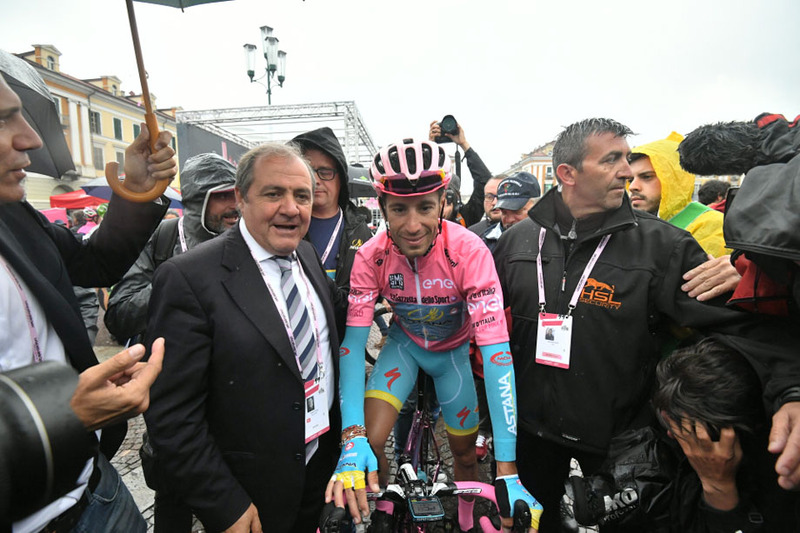 The Giro d’Italia is also on the small screen in the Middle East and North Africa thanks to live coverage on beIN Sports, while in South Africa and Sub-Saharan Africa the Giro is on the Supersport channels. In Asia, the Corsa Rosa in available in 16 countries via Eurosport Asia Pacific; J Sports is covering the race live and exclusive in Japan. LeTV is doing the same in China. Race highlights are on FPT Telecom in Vietnam, while the Thai public can enjoy the key parts of the stage on both True Visions and NOW26. The huge interest that Australia has shown in the Giro continues in 2016: SBS is showing all 21 stage live, while Fox Sports is showing highlights. In New Zealand, Sky is showing the race live and in highlights. Finally, the Corsa Rosa is being shown worldwide via SNTV - Sports News Television and Sport24, the 24 hour sports channel for airline and cruise ship passengers. During yesterday's stage, around 1.3 metric tons of rubbish were collected, 85% of which will be recycled. Over 45 tons of rubbish has been recycled so far at the Giro.